MEAD, Neb. - Massive flooding in the Midwest has knocked out roughly 13 percent of the nation's ethanol production capacity, as plants in Nebraska, Iowa and South Dakota have been forced to shut down or scale back production. 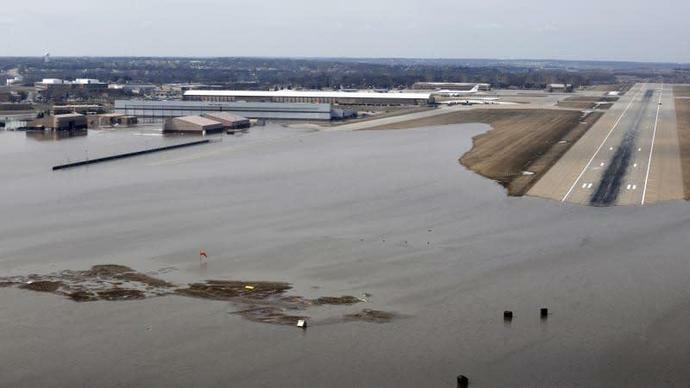 Production facilities owned by large companies like Archer Daniels Midland and Green Plains were still operating despite days of snowstorms followed by rains that sent record floods into the Farm Belt. The U.S. has some 200 ethanol plants capable of producing 1.06 million barrels per day, and about 100,000 to 140,000 barrels per day of capacity has been taken offline due to the floods, according to three traders who track operations. "It's only to get worse. I think we are looking at a three- to four-week situation. Typically, exports would help fill the void, but we are being told that Brazil doesn't have any excess supplies," said one trader. Among the plants that have scaled back are ADM's plant in Columbus, Neb., the largest in the United States, due to flooding of a small rail line serving the plant, said Chris Cuddy, president of Carbohydrate Solutions at ADM.
"Transportation is definitely affected. All rail cars were put on hold since last Frida,y and they were not allowed to be sent out. We are not sure when it will be back to normal operations," said Scott Tingelhoff, general manager at AltEn, an ethanol processor in Mead, Neb., which produces about 24 million gallons of ethanol a year. Mike Jerke, chief executive of Southwest Iowa Renewable Energy, which runs a 120-million-gallon-a-year ethanol production plant in Council Bluffs, on the border of Iowa and Nebraska, said he has had to cut production. Corn farmers are still digging out from the flooding, and some have already determined some of their supplies are unsuitable. "Since this weekend, our rates have been day-to-day as we manage the supply chain issues," Jerke said. Omaha-based Green Plains, which has a market value of $700 million, said its five Nebraska plants are dry, but they are facing rail challenges around their Atkinson, Ord and Central City plants. The company is looking for ways to work around the flooding, such as unusual trucking routes, said company spokesman Jim Stark. "It may take a couple of weeks to understand the total impact of the flooding," Stark said.